Prologue - What Am I Doing Here? A stale, sweaty fug fills the cab. It’s a sticky Saturday night in mid-July, so the windows are rolled up and the air-conditioning is blasting. It’s keeping us cool but only serves to circulate the smell. I tell him I’d rather have some fresh air and roll down the window. He sounds embarrassed but also unapologetic, which suggests that while he does care, there’s also nothing he can do about it right now. Briefly, I feel chastened. He hasn’t had time to sleep much, either. Ever since the war between Israel and Hezbollah broke out on Thursday morning - claiming Lebanon’s only international airport as its first victim - life has been frenetic for the taxi drivers plying the Beirut-Damascus route. Mahmoud’s been shuttling back and forth in his big yellow cab four, maybe five times a day. I tell him not to worry. I don’t really care and besides, I have much larger concerns. Like whether we will get to Beirut in one piece, what with the Israeli air force patrolling the skies, blowing up roads and bridges all over the country. Besides, without Mahmoud and his fragrant feet, I’d still be standing outside the Syrian border post at Jdeidet Yabous. Like the rest of the world, the July 2006 War caught me off-guard. When I’d left Beirut 10 days earlier on assignment to write a guidebook on Dubai for Wallpaper Magazine, the city had been in full summer season swing, chock full of Gulf tourists who come to summer in the cooler climes of Lebanon’s mountains. Small at the best of times, Beirut had been bursting at the seams. Bumper-to-bumper traffic and restaurants so crowded that even places that never asked for reservations had waiting lists. It was the city’s busiest tourist season since 1974, the year before Lebanon plunged into the decade and a half of civil and not-so-civil wars that turned it into a household word for urban hell. This reputation was something Beirut still struggled to escape, even though by the time I first turned up in 1998, eight years after the fighting ended, it was already out of date. By 2006, the city had recovered most of its pre-war swing and if it was not entirely at peace with itself, it was only in the breathless opening paragraphs of nostalgic war correspondents who last visited in the 80’s (and their younger wannabe protégées), that it was still a dangerous place to be. Which is not to say that sometimes, bad old Beirut didn’t resurface. The previous 18 months had been extremely rough, even by Lebanese standards. On Valentine’s Day the year before, the former Prime Minister Rafic al-Hariri and 33 others had been murdered in a massive car-bomb attack on Beirut’s seafront. That act was so callous, it brought over a million Lebanese - a quarter of the population - out onto the streets, demanding justice and that the Syrian Army, which had been occupying the country for almost 30 years, go home. After months of protests, as well as counter protests by factions that profited from the status quo, the withdrawal had finally happened, much to everyone’s disbelief. A string of car-bombings followed. As these were exclusively targeted at cultural and political figures known for their opposition to Syrian control of Lebanon, it was often assumed that these were Damascus’ parting gifts to the Lebanese. Despite this, in late June 2006, as I began to plan my trip to Dubai, the country seemed so buoyant that for the first time in eight years, I hadn’t felt the need to keep an eye on the news while I was away. On Thursday the 13th, the day before I was due to fly home, the friend I was staying with in Dubai mentioned something about a ‘flare-up’ along Lebanon’s southern border. There wasn’t much online, so I switched on the TV and tuned into a Lebanese satellite channel just in time to see Israeli fighter jets blow craters into both runways at Beirut International. For the next few hours, no one was sure whether this first round would escalate or if Israel, having instantly severed Lebanon’s only air bridge to the outside world, felt it had delivered its latest ‘message’. Almost immediately, repair crews were out trying to fill in the holes so that planes could resume landing. Just as they finished, Israeli jets returned and made even bigger holes. Tel Aviv obviously intended for Lebanon’s only international airport to stay shut. Then, they began bombing the rest of the country. I spent most of the day on the phone, calling friends to make sure they were safe and trying to reach Lebanon’s national carrier, Middle East Airways, to find out how I was going to get home. By the evening, I still didn’t know. The following day, the start of the weekend in Dubai, the MEA offices were closed and the helpline at the airport in Beirut went straight to answer phone. I called the MEA office in Beirut only to get a pre-recorded message explaining that they were working on finding alternate ways of getting passengers home and that I should call again later. The only real possibility was for MEA to re-route to Damascus but as I discovered when I finally got someone on the phone the following morning, for reasons best known to themselves and which possibly involved pique over having been forced out the previous year, the Syrians weren’t allowing this to happen. I was told apologetically that all MEA could do under the circumstance was to fly me to Cyprus or Jordan. As the ferry services to Cyprus had not run since the 1980’s and landing in Amman would mean going overland through Syria anyway, the quickest way back into Lebanon was to fly directly to Damascus. If Syria decided to close the border at Jdeidet Yabous, which it might do if the Israelis followed up the airstrikes with an invasion, I would be cut off. If Israel extended its airstrikes to Syria, as it had threatened to do in the past in the event of renewed conflict with Lebanon, there would be no way back. I had no intention of sitting the conflict out in Dubai. I couldn’t afford to wait. I ditched the MEA ticket, booked a one-way flight with Emirates and a few hours later, was on my way. 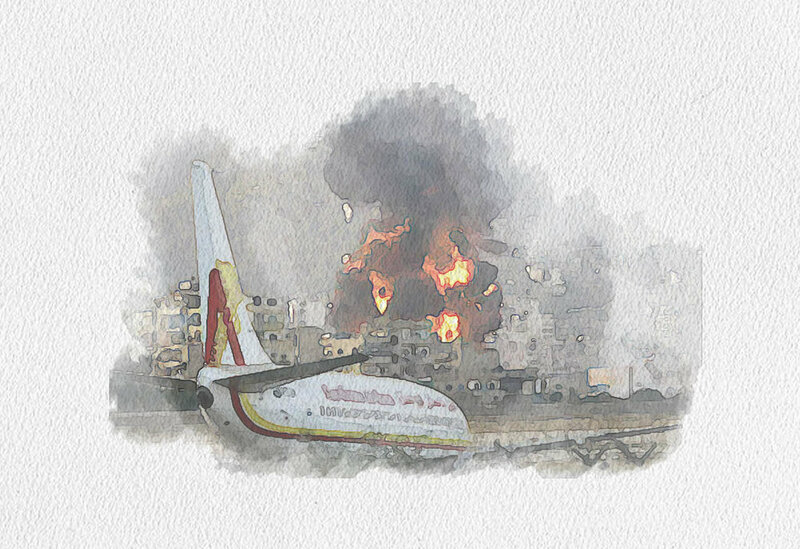 The plane was practically empty, just three Syrian businessmen, a couple of ashen-faced Lebanese, a Kuwaiti on his way to find his brother, who had been summering in Lebanon but wasn’t answering his phone and a Saudi on his way to his villa in the mountains to rescue his terrified wife and children. Like me, they spent most of the time in the departure lounge making calls. I still faced the issue of how I was going to get into Syria. Journalists are required to obtain special visas, regardless of their reason for visiting. Most came through in a couple of days but mine always seemed to take a bit longer. As I couldn’t afford a delay, I took a gamble. Rather than follow procedure, I decided my best bet was to force the issue by presenting my arrival as a fait accompli. Calling the Syrian Ministry of Information just as I boarded, I told them that I was enroute to Damascus, that I wanted to back into Lebanon and would they please issue me permission to travel from the airport to the border? Before she could protest, I hung up. My heart was pounding. There was no guarantee this would work. The Syrians were under no obligation to let me in to their country and legally, had the right to deport me but I was banking on the exceptional circumstances warranting an equally exceptional response. By the time I landed, my visa was waiting. Coasting through Immigrations, I jumped into a cab and was at Jdeidet Yabous barely forty minutes later. I needn’t have hurried. It didn’t look like there was anyone here but us. I’d sensed on the drive out that the cabbie, who’d boldly informed me at the airport that he’d take me all the way to Tel Aviv if I wanted, was having second thoughts. When he asked for half the fare upfront as we pulled up at passport control, I had a feeling he might not be there when I came out. For the second time that day, Syrian officialdom was efficient and gracious. After a few questions, asked with a touching concern that nevertheless made it clear I must be entirely mad to voluntarily drive into a war, the border police stamped my passport and sent me on my way with an Allah ma’ak. If ever there were a time to be a believer, it was now. Leaving the building, my suspicion was confirmed. The taxi had vanished. Thankfully, my bag hadn’t and was sat on the pavement. Waiting next to it was a rather embarrassed stranger. He apologised as I walked over and told me the driver had asked him to tell me that ‘something had come up’, so he’d had to rush back to Damascus. We both knew that was a big fat lie but honestly, who could blame the guy? Who in their right mind would drive into a war voluntarily, anyway? I briefly wondered if I’d finally lost mine. But there was no time for that now. I was already checked out of Syria. Wishing me luck, the stranger ambled off in the direction of a nearby café. It looked like it was closed. He turned and gave me a goofy smile and a kind of Charlie Chaplin shrug, which made us both laugh. Maybe. But the border post at Masna’a was eight kilometres away and there wasn’t exactly a steady stream of traffic heading in that direction. Probably because one of the air strikes that morning had targeted a small convoy of cars at the Lebanese border post. They’d been incinerated. It was almost sunset. Briefly, I considered walking to Masna’a, but with night on its way, the idea of getting caught in the dark wandering around in the middle of a war in the strip of no-man’s land between the Lebanon and Syria, didn’t seem very clever. A warm wind blew up the road from Lebanon. But the air was the only thing that was moving. The highway was so deserted and dusty that if tumbleweeds had rolled by, I wouldn’t have blinked. I dug a warm bottle of water out of my backpack and sat on my case. There was no choice. I needed transportation of some kind, so I settled in and prepared to wait. The story continues next Friday, 30th November.